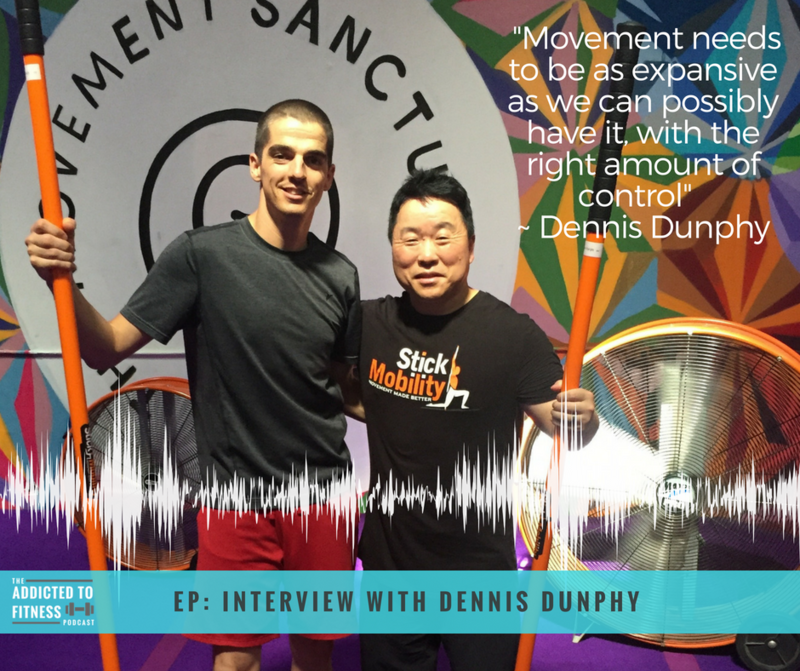 Today’s podcast was a highly anticipated episode (for us especially), as we are finally hearing straight from one of the co-founders of Stick Mobility, Dennis Dunphy. 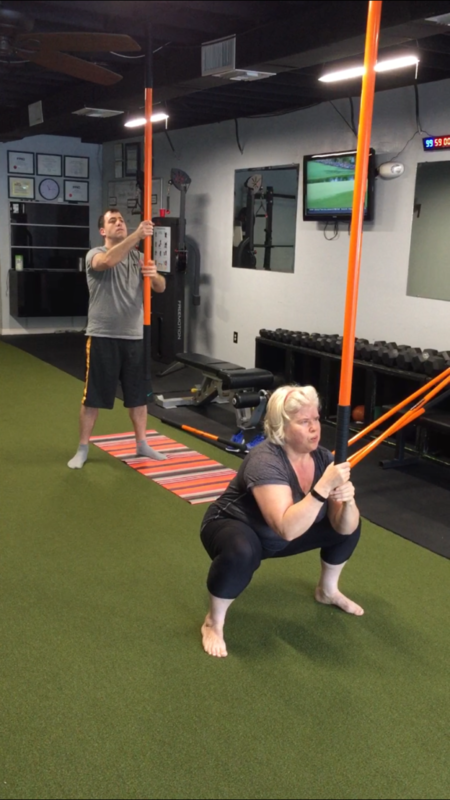 You’ve heard us talking about Stick Mobility before, and Nick recently went to the certification course. It was an incredible educational weekend that left him completely inspired. The course highlighted the idea that we’re robbing ourselves of our natural movement patterns. We’re taught that there are “wrong” ways to move, which is a misleading idea. This week’s interview gets more into that and much more! So without further ado, here are the main points from this week’s interview with Stick Mobility Co-Founder, Dennis Dunphy! Dennis grew up very active and applied that interest to become a personal trainer in California in 1997. Like many, he started off with a very “meat head-ish” approach, but as he got older and injuries occurred, his interest evolved his training to incorporate more mobility training. 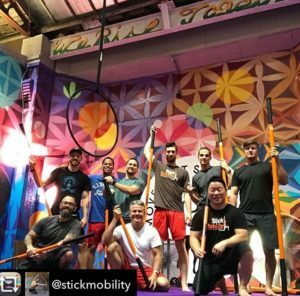 Stick Mobility grew out of Dennis and the other founders attending a stick yoga class, as they saw the strength training component was not truly present in stick yoga. Sherrington’s Law of Irradiation (a guiding principle of stick training): a hard-working muscle will recruit neighboring muscles groups, and if those muscles are working as part of the action, it amplifies them to make them as strong as the primary muscle. Pushing and pulling on the stick gives the user the feedback they need to create irradiation in specific muscle groups – this helps to build strength! A great example of a signature movement is the Dunphy Squat (pictured below & named after Dennis), which allows users to achieve a deep squat and produces a tremendous amount of neural overload (to stimulate the muscle strength). Another big focus is grip strength. The idea of how our lack of movement today works against us and how our bodies are meant to move: The body adapts to the stimulus we give it or that we don’t give it. So sitting at a desk has caused us to lose the neuromuscular control of our shoulders and upper back, making it essentially impossible to do a proper overhead press or pullup (which we can do when we’re kids). Stick Mobility is currently used by pro sports teams like Cincinnati Bengals, Los Angeles Dodgers, Philadelphia 76ers. The University of Southern California Football team is also using them. The final piece of fitness advice from Dennis – Stay physically relevant; adjust your training style to allow you to stay fit as long as possible. Want to connect with Dennis? Maybe signup for a class? Here’s where to go! We might be biased, but we predict that Stick Mobility has a big future ahead! It’s a great practice for those at any fitness level, which is a key aspect to any long-lasting physical practice (just like yoga!). Most of us aren’t learning neuromuscular control as part of our physical health and fitness. Yoga and Stick Mobility are both excellent options to teach this and can be applied to healthy or unbalanced/injured bodies alike. Nick has truly changed his approach to training after his certification. He’s applying Stick Mobility principles throughout his training and his Stick classes are sure to see a new dimension of expertise! Be sure to check him out and follow the ATF Facebook page to see a video of a Stick Class led by Nick. Also, please give us a rating and review in iTunes & Apple Podcasts so we know what you think about the podcast. And if you’re sipping your coffee as you listen to the show, don’t forget to visit hempcoffeeexchange.com and try one of their delicious products. Use our promo code ATF to get 20% off!